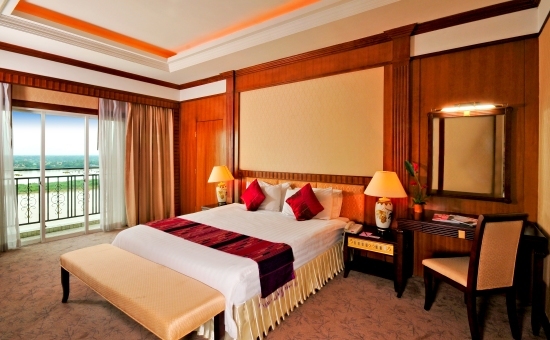 Our Executive suites boasts a bedroom complete with a king size bed and a living room. A favourite among ministers of states, these enormous 72 sq. 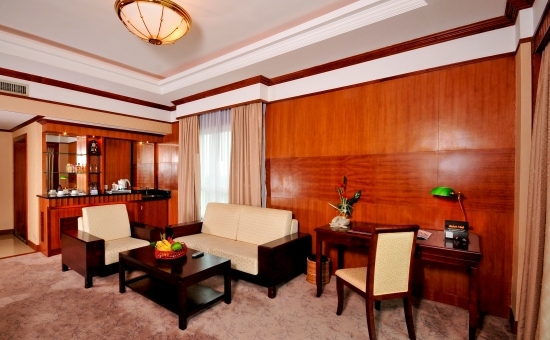 meter rooms have hosted many businessmen and politicians who seek to retire to a well designed room, spacious and comfortable without forgetting the need to be connected to the world. Featuring modern furnishings with a warm and inviting feel, complemented by deluxe amenities, including king bed with plush duvet, living/lounge area, pantry area, generous work area with high-speed wireless Internet access, plus bathroom with soaking tub, walk in shower and plush robes complete with luxurious amenities, individually controlled centralized air-conditioning, IDD Calls with bathroom extensions and voice mail, in-room electronic safe, mini bar with coffee/tea making facilities, computer ports, facsimile machine and high speed internet access for a comfortable and relaxing stay. Deco - This 2 rooms suite is elegantly decorated in warm, muted tones, with plush linens, exotic Lao wood, chandeliers, grand sofa set and carpets . - If the number of guests travelling exceeds the maximum occupancy stated, please book more than one room or contact the Hotel directly for alternate accommodation options and assistance.